Are you after a bike rack to carry your bikes? In this page, I’ll share with you some of the important information about bike racks, as well as the bike racks that I recommend. If you’ve tried transporting your bike inside your car, you probably know it can be quite a hassle and sometimes leaving a big mess to clean up. Not only you’ll need to remove the wheels but you also risk staining your seats with mud, sand and dirty chain. 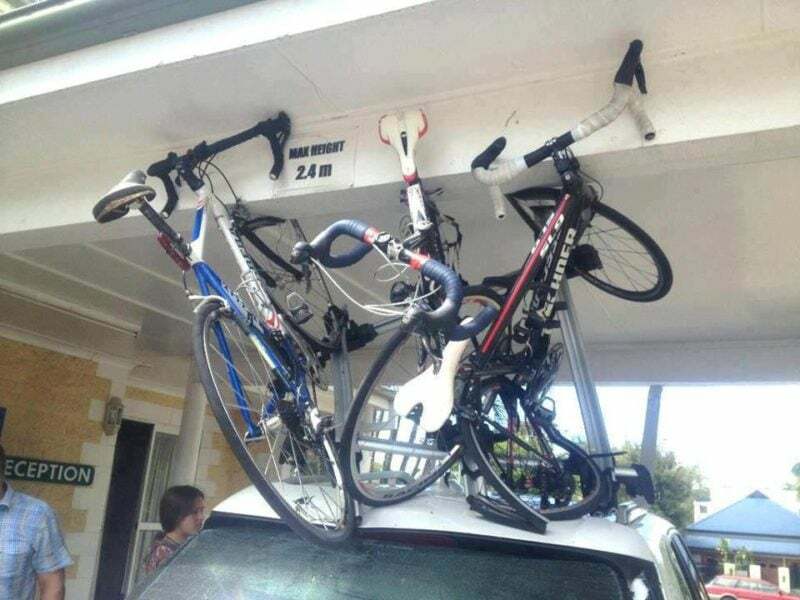 Getting a bike rack is the answer. If you need to carry more than one bike, then you’ll definitely need a bike rack anyway. Unsure which is the best bike rack for you? Then first ask yourself these 5 questions about bike racks to determine your actual needs. Otherwise, here are the best bike racks, according to their usage types. The Yakima High Road is my top pick among all the bike racks. While Yakima might not be as popular as Thule when it comes to bike racks, the Highroad is certainly among the best in its class. It’s secure, very stable and surprisingly easy to use with no tools needed. It can fit a wide variety of bikes with tire widths ranging from 23mm to 3.25” without any problems. No wheels are removed as the rack secures the bike by its wheels. Good for : If you own an expensive carbon fiber bike, you want it to be contactless with the mount. The Yakima High Road does exactly so. The Kuat Trio is a minimalist, fork mounted roof rack, which means you’ll have to remove the front wheels. Even though Kuat might not be a household name in bike racks, their products have been gaining traction and raving reviews in the past 1-2 years. The Trio is definitely one of their best-selling bike rack. It uses a 3-way mounting system; 2 at the fork and 1 at the rear wheel. The fork is intelligent enough to adapt to bikes of all types and sizes. Good for : Look no further if you’re after a sleek and minimalist looking roof bike rack. Thule is the market leader in bike racks. 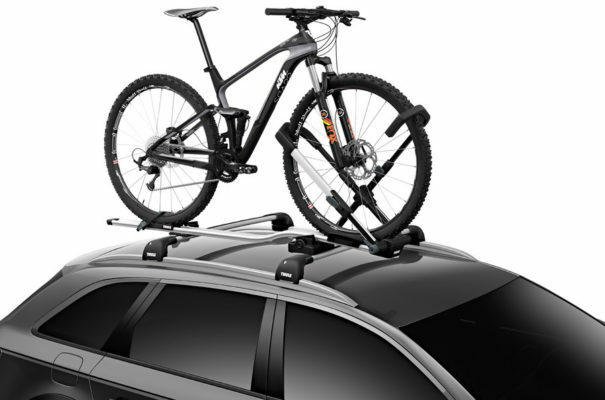 They continue to lead with the Thule Archway XT trunk rack and you definitely can’t go wrong with the Thule brand. Depending on your needs, it comes with a 2-bike or 3-bike variation. There are 2 unique features that aren’t present in other trunk racks. The No Sway Cages that prevent the bikes from hitting each other and soft dampening cradles ensure the bikes don’t bounce too much and stay silent throughout your journey. Best of all, it comes with anti-theft locks which lock the bikes to the rack, and the rack to the vehicle. 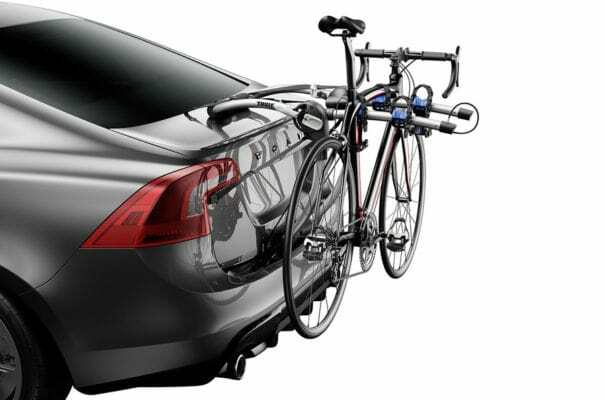 Good for : If you’re looking for a trunk bike rack with added security, the Thule Archway XT is a great choice. Saris is a U.S. bike rack manufacturer based in Madison, Wisconsin. 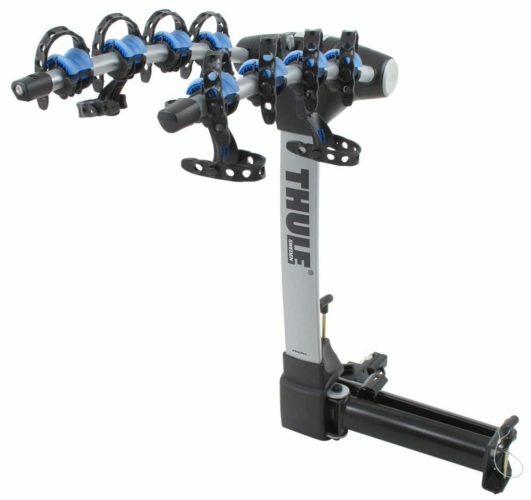 Though not as popular as Thule or Yakima, they do produce some of the best value for money bike racks. With an arc-based design, the Saris Bones 2-Bike rack can be fitted on almost all types of vehicles, even SUV’s with a vertical rear door. It can carry 2 bikes, with each bike having a maximum weight of 35lbs/16kg. Securing the bikes on the rack is as easy as it can get using the 3 Velcro straps that go around the top tube and seat tube. And when it’s not in use, it can be folded up flat and stored away. 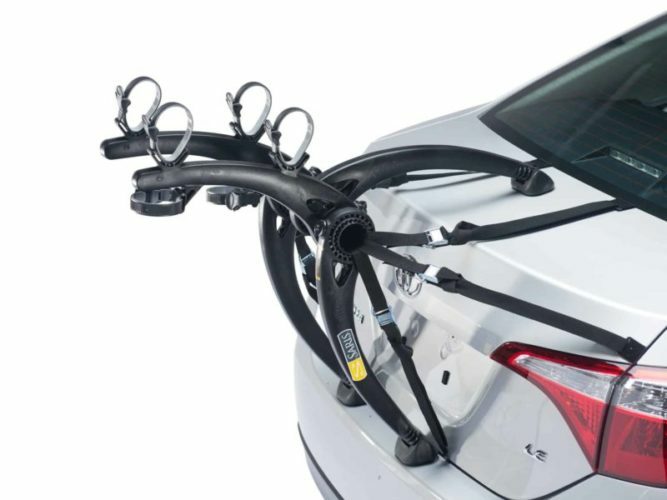 Good for : If you’re after the best value for money trunk bike rack, then I’d recommend to strongly consider the Saris Bones 2. The T2 Pro XT is Thule’s premium hitch bike rack offering. The XT is an updated version where the lateral spacing between bikes are increase to avoid them coming into contact with each other. 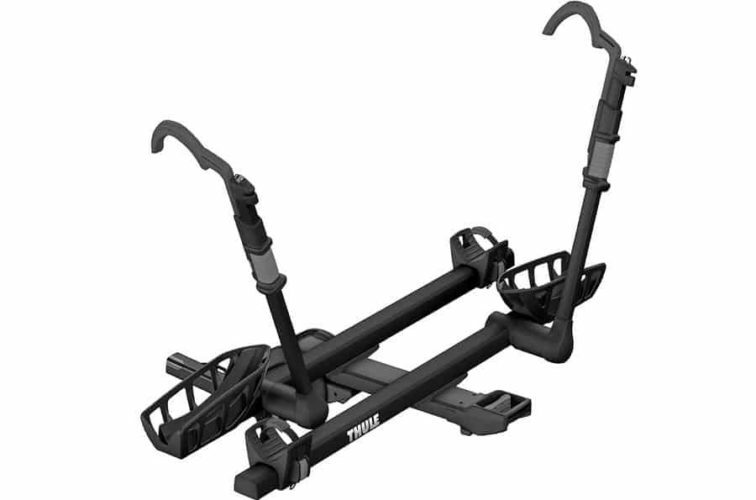 As with all Thule’s products, you can expect a very solidly built rack that fits 2 bikes with tires as wide as 5”. The good news is, there are add-on adapters to extend the carrying capacity to 4 bikes, if needed. If you’re concerned about theft, you’ll be glad that there are integrated locks that secures the bike to the racks, and the racks to the hitch receiver. 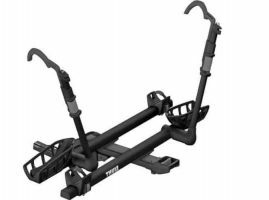 Good for : This is without a doubt the best hitch bike rack available today and it comes with a hefty price tag too. The Kuat Sherpa 2.0 has undergone major improvements over its predecessor and is now much sturdier thanks to an all-aluminum construction. The design is simplified for a minimalist look and is aesthetically pleasing with a powder coat finish. It carries up to 2 bikes (non-expandable capacity) with tires up to 3” and a maximum weight of 40lbs/18kg for each bike. If you’ve a heavier bike, consider the Kuat NV 2.0 which has a maximum weight of 60lbs/27kg per bike. There are 3 color options to choose from black, grey and pearl metallic. Good for : The Kuat Sherpa 2.0 is the cheaper and lighter alternative to the Thule T2 Pro XT while still retaining all the key features a premium tray rack should have. 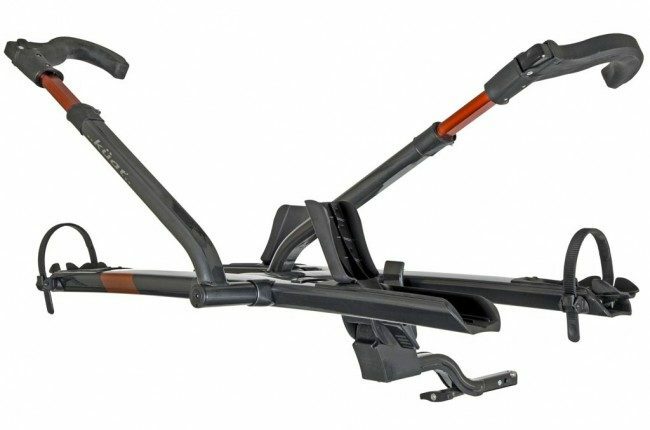 The Thule Apex Swing 4 is the best in class when it comes to swing-away hitch racks. It has an arm-style hitch where it can swing 180 degrees to the vehicle’s side for access to the trunk. It takes up to 4 bikes at once, with each bike weighing a maximum of 35lbs/16kg. The bike rests on the cradles with a rubber strap going over the top and down tube to secure it. Security wise, there’s an integrated cable locking mechanism where the cable loops around the bike’s top tubes. The hitch rack itself is secured to the car via another lock at the hitch receiver. Good for : If easy and immediate access to your vehicle’s trunk is a major consideration, you might want to seriously consider the Thule Apex Swing. The Kuat Beta is the favorite among those who’re on a budget and want to carry 2 bikes. It’s very light, weighing only 13lbs/6kg for the 2” hitch receiver version and can be folded up flat for storage especially if you’ve limited space in your garage or apartment. As with all hanging hitch racks, the bike’s top tube sits on the cradle and is secured by looping a plastic strap over the top and seat tubes. Good for : If you’re on a budget and yet want a bike rack from a reputable brand, then the Kuat Beta could be for you. Buying a bike rack can sometimes be a confusing and complicated process. I’m sure you’ve seen many types of bike racks on other vehicles before. Some are on the roof while some are at the rear. So, before we jump into the type of bike rack you’ll need, ask yourself these questions to determine your actual needs. 1. How many bikes will you be carrying? Most bike racks will carry up to 2 bikes comfortably. Some have variations (different model or expandable capacity) that can go up to 3 to 4 bikes. If you’re going to carry 4 or more bikes, you’ll probably need a combination of both hitch bike racks and roof bike racks. 2. How often will be you be using the bike racks? If you find yourself using them often, you might want to consider a roof rack since they’re a permanent fixture on your vehicle. You can save the hassle of assembling and dissembling and finding a space in your garage to store them when not in use. If you use them intermittently, give hitch racks a consideration as you can remove and store them when not in use. 3. Do you need easy access to your vehicle's trunk? Roof racks is the recommended option if you need fast and easy access to your vehicle’s trunk. If roof racks are not your thing, then consider hitch racks. There are 2 common types of hitch racks – tray racks and hanging racks. They can either be swung sideways or tilted to allow you easy access to the trunk. 4. Does your vehicle have a hitch receiver? If your vehicle already has a hitch receiver or you plan to install one, then go for hitch racks. Most hitch racks today use either a 1.25″ x 1.25″ or 2″x 2″ receiver. Having a hitch receiver also allows you to transport other things such as a camper and boat. 5. Are you comfortable with your bike coming into contact with the racks? 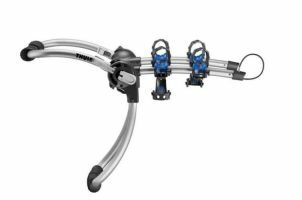 If you own an expensive bike or one with an oddly shaped tube, like aero bikes, then consider either a roof rack like the Yakima High Road or tray style hitch rack like the Thule T2 Pro XT. Most of them secure the bike by the wheels rather than the frame these days. It’s not uncommon for the bike racks to damage the bike’s paint job at the points of contact, especially when it’s not secured carefully. Many of the best bike mount brands like Thule, Yakima, Kuat and Saris have all 3 types in their product lineup. 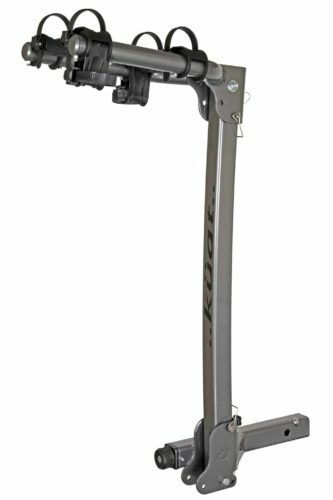 In recent years, hitch bike mounts are gaining popularity among cyclists mainly due to its ease of loading the bikes. Roof and hitch mounted racks are more expensive while trunk mounted racks are more affordable. Let’s take a deeper look into each one of them. This is the all-time favorite type of bike racks. You’ve probably seen them everywhere all these years including at professional bike races. Roof bike racks require your vehicle to have a base rack. Some vehicles, especially SUV’s come with them factory installed. If your vehicle doesn’t have one, you can always get the aftermarket ones. These days, the upright style is the preferred method as the bike frame doesn’t come into contact with the racks, greatly reducing the risk of damaging the bike. A fine example is the Yakima High Road roof bike rack. If you have an aero bike, you’ll appreciate the upright mount since the aero bike’s downtube is non-rounded, which isn’t compatible with most downtube clamps. Visible rear window. Since the bikes are on the roof, you’ll have an unobstructed view of the rear window for safer driving. Contactless. Securing the bike via the wheels protect your bike’s paint job and carbon fibre. Uncompromised access to the trunk. Useful if you need to access the vehicle’s trunk mid journey. Height. You’ll need to lift the bike over your vehicle in order to mount it. This requires some effort especially if the bike is heavy. Vulnerable to bike damage. Keep in mind the extra height your vehicle has when driving through overhangs. Otherwise, you’ll be in for an unpleasant surprise. As I mentioned earlier, hitch mounted racks are quickly gaining popularity in recent years because it’s much easier to load the bikes due to its low height. The hitch rack mounts directly into a hitch receiver at the bottom rear of your vehicle. 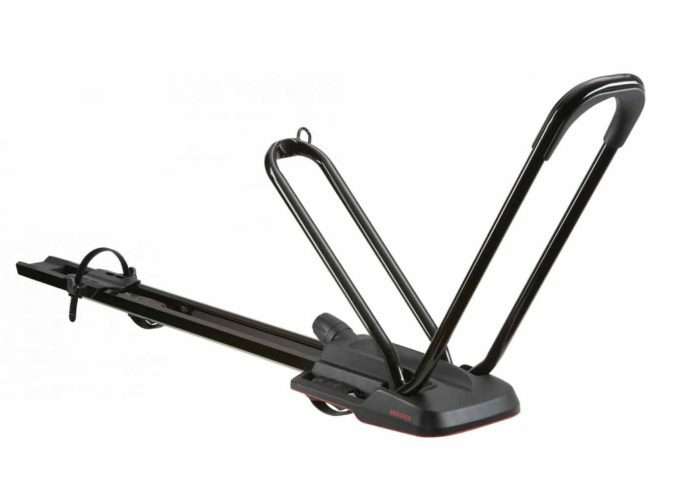 Unlike the roof racks, you can easily remove and store away the hitch racks when not in use. For a try hitch rack, the bikes sit on a tray rack or platform with their weight on the wheels. The latter is more popular as it doesn’t come into contact with the bike frame. Both are equally secure, so it’s more of a personal preference especially if you have an expensive carbon fibre bike or a custom paint job which you don’t want to risk damaging it. Trunk Access. To access your vehicle’s trunk, you can tilt the tray or swing it sideways. I’d recommend the Kuat Sherpa 2.0 for the tilting option and the Thule Apex Swing 4, which can be swung 180 degrees sideways. 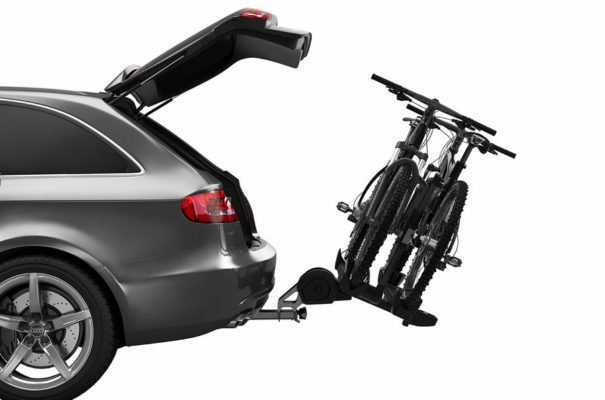 Some models such at the Thule T2 Pro XT hitch bike rack even have options where you can expand the carrying capacity with additional accessories. The bikes’ top tube sits on the rack, hence it’s referred as hanging. A good example if the Kuat Beta hitch bike rack. The hanging hitch rack are not suitable for bikes with odd shaped top tubes especially aero bikes. I also wouldn’t recommend using them for carbon bike either since you’ll need to clamp the top tube which is vulnerable of cracking if overdone. Versatile. They can carry all types of bikes. Good for CX, gravel, mountain and fat bikes. Easy to Load. Hitch racks sit low and makes it easier to load the bikes especially if you’ve a heavy and/or dirty bike. Hindered access to the trunk. You’ll need to either tilt or swing the racks sideways to access the vehicle trunk. Hindered rear window visibility. With the bikes sitting behind the rear window, your rear mirror view is hindered. If roof and hitch racks are not suitable for your vehicle, then consider trunk mounts. Generally, trunk mounted bike racks are cheaper as well. A good option for those on a budget is the Saris Bones bike trunk mount. Trunk mounts are by far the most versatile among all bike racks. Due to their design use a simple pull straps to hold the mount in place, they can fit a wide range of vehicles, from small to large SUVs and even those with a vertical rear door. Very versatile. Fits most vehicles without needing additional accessories. Inexpensive. Great option for those who are just starting out. Complicated access the trunk. The bikes and racks need to be removed before you can access the vehicle’s trunk. Lacks security. The trunk rack is clipped and strapped on to the vehicle without any locking mechanism, making it prone to theft. 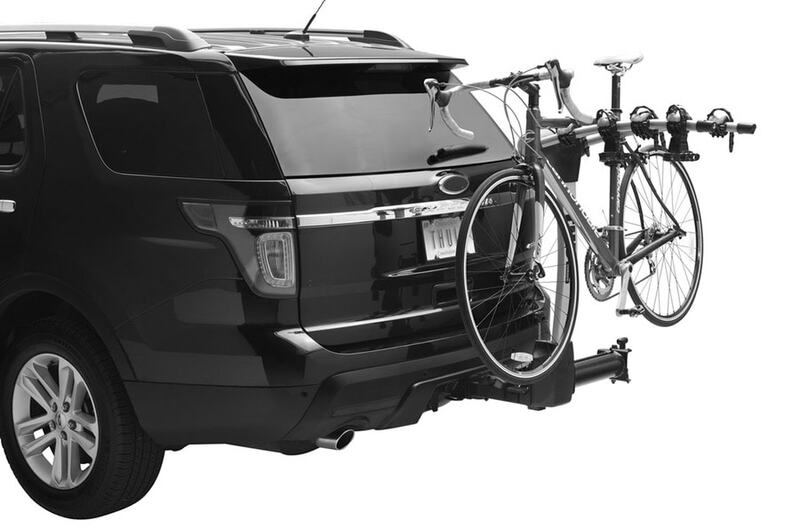 In order to use a hitch bike rack, you’ll need to have a hitch receiver installed at the bottom rear of your vehicle. Pay particular attention to the type of hitch, especially the compatibility between your vehicle’s hitch receiver and the rack’s hitch. There are 5 hitch classes and they are classified according to their maximum weight capacity and the size of the receiver opening. The higher the hitch class, the larger its opening to support a heavier load, commonly referred as the tongue weight. For hitch mounted bike racks, they’re either Class 2 or Class 3. Class 1. The hitches are 1.25” x 1.25” in size with a maximum weight capacity of 200lbs/90kg. They’re generally installed on small to medium sedan cars and used for towing light load such as small utility trailers. Class 2. The hitches are meant for moderately heavy load with a maximum weight of 350lbs/159kg. The size of the hitch receiver is 1.25" x 1.25". Class 3. Typically found on pickup trucks, SUV’s and minivans to tow campers, trailers and small boats. The receiver size is a square 2” x 2” and has a maximum weight capacity of up to 600lbs/272kg. Class 4. These are heavy duty hitch receivers with 2” x 2” in size. 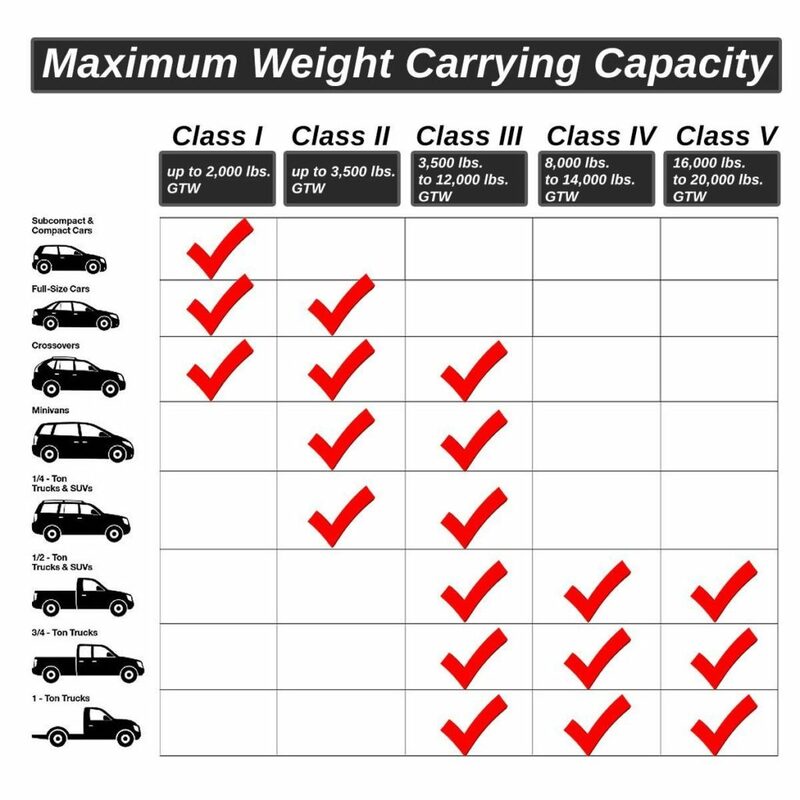 They can carry a load up to 1000lbs/453kg such as large campers and boats. 1. Are bike racks safe for the bikes during transport? Yes bike racks are safe for the bikes when mounted securely on the bike racks. But don’t leave anything to chance. Always remember to check and re-check that your bikes are mounted securely before you start your drive. If possible, always go for reputable bike rack brands as they’re better built with high quality materials. 2. Can bike racks be stolen? Bike racks can be stolen easily especially the hitch and trunk mounted ones. Cheaper models usually don’t come with a lock that secures the rack to your vehicle. Mid to premium models usually come with a two locks; one to lock the rack to the vehicle, and the other the bike to the rack. 3. Which type of bike racks are suitable for SUV? Hitch racks are ideal for SUV. Since they’re low in height, it’s easier to load the bikes. If your SUV already has a base rack or roof rails, you can also consider roof racks.